Your kingly father (the king) has sent you and your siblings each off in a different direction to build a successful castle in the barbarian infested region at the edge of the empire. Whoever does the best job becomes the successor to the throne. Will it be you? 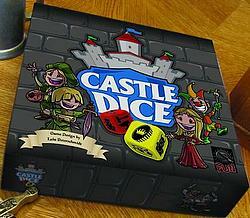 Castle Dice is a Euro-style game with a ton of custom dice, lots of tactical and strategic choices, a strong focus on drafting resources, and a fast paced turn sequence that allows an entire game to be played in about 45 minutes.